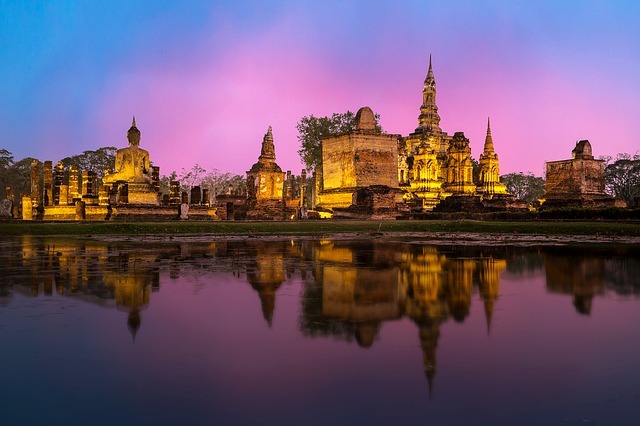 Thailand’s bustling capital city is a destination packed with plenty of sites, tastes, and experiences for any traveller. From affordable luxury like fine dining and massage, to history and culture found in temples and at markets, there is an abundance of brilliant things to do in Bangkok. Feel fancy at one of 2018’s top 40 best restaurants in all of Asia. For a reasonable 1,200‎ baht per person, or about £30, you can feast at authentic, Michelin star Thai restaurant, Bo.Lan. Indulge in this eco-conscious eatery’s fixed price lunch menu, offering a well-rounded, traditional Thai culinary journey including salad, soup, stir-fry, and curry, topped off by your choice of the dessert of the day or a fruit plate. Alternatively, their à la carte lunch menu averages 650 baht per dish, or about £15. For anybody living large and willing to spend a bit more, dinner starts at 2680 baht, or about £60 per person. Just one of a myriad of temples to be found in Bangkok, Wat Pho is home to the enormous and famous Reclining Buddha, one of the biggest Buddhas in all of Thailand. It’s one of the city’s oldest and most important temples, so there’s plenty to see in addition to the landmark Buddha. The Phra Maha Chedi Si Rajakarn are a group of four colourfully tiled pagodas, the Yak Wat Pho — also known as Wat Pho’s Giants — are large statues guarding the entrance to the scripture hall Phra Modop, and the rock garden Khao Mor are just a few of the other things that make the temple worth visiting. Thai massage and foot massage are also available, at 360 baht for 30 minutes or 420 baht for 60 minutes. The temple is open from 8:00am – 6:30pm, entry is 100 baht, and modest dress is required. 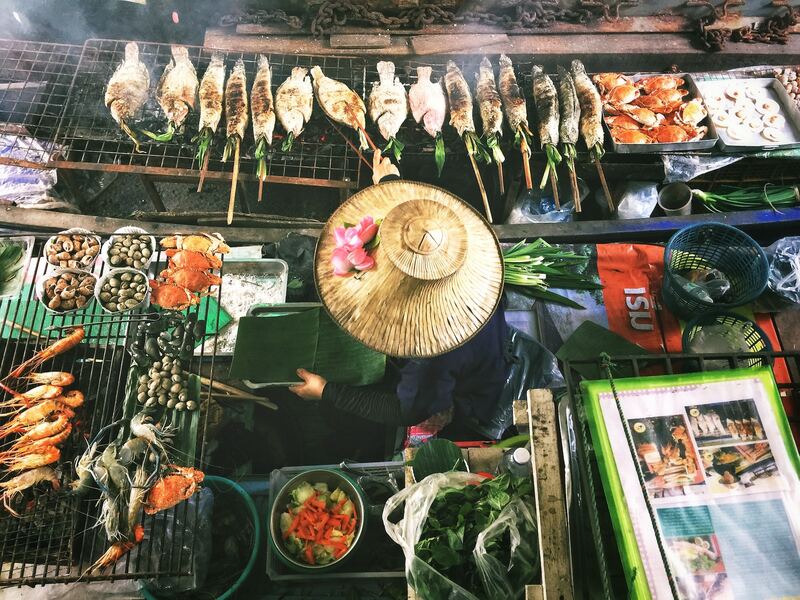 Thailand’s floating markets are impressive ecosystems of vendors selling fresh produce, snacks, and freshly prepared hot meals to eager customers. Damnoen Saduak is the largest and therefore the most overrun with tourists, but still a fun and lively experience. The market opens at 7:00am, so get there early to beat the crowds. A short distance outside of Bangkok is the Amphawa Floating Market, and is frequented by tourists and locals alike, and offers a more authentic experience. 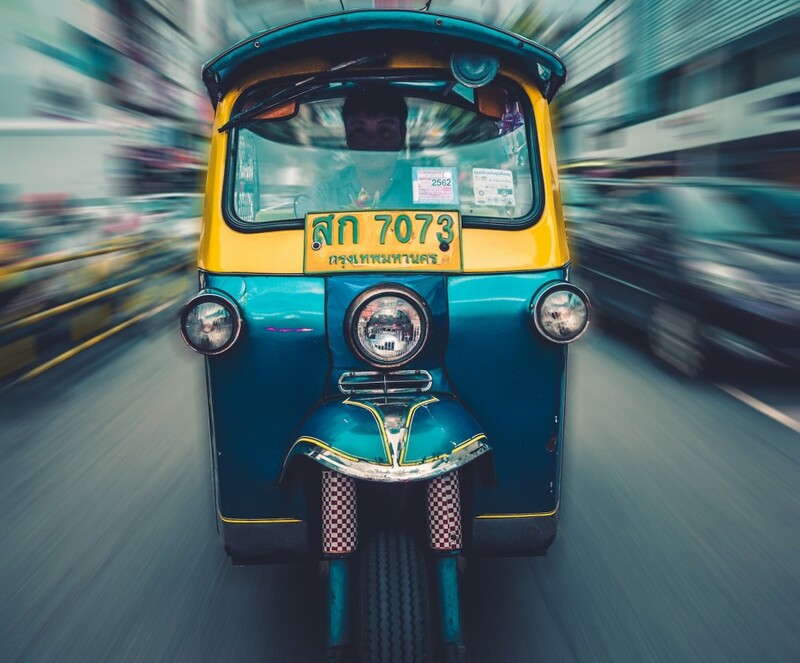 The tuk tuk is a pretty ubiquitous sight in Bangkok, and a visit to this busy city is almost incomplete without having experienced at least one ride in one of these three-wheeled vehicles. Try to catch one away from the most touristy centres, and don’t let the drivers coerce you into paying more than is fair or talk you into going somewhere you aren’t interested; be clear on your destination and price before jumping in. They aren’t renowned for their luxury and comfort, so they’re probably best for travelling shorter distances, but they do provide a fun adventure. 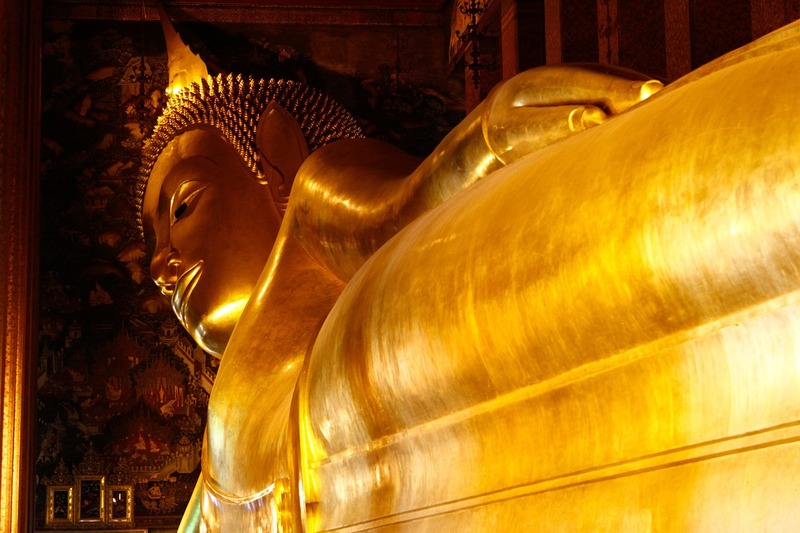 Get to know Bangkok through a local’s eyes via a tour (with a 25% discount for HI members!) with Urban Adventures. You can explore the city by bike, eat your way through Chinatown, journey through the canal system on a longtail boat, or take a cooking class and learn how to cook your favourite Thai dishes, just to name a few. Each tour and experiences is led by a knowledgeable local guide, passionate about their city and eager to share what they love about Bangkok with you. How big is the world’s largest weekend market? Try15,000 stalls spread across 35 acres big. 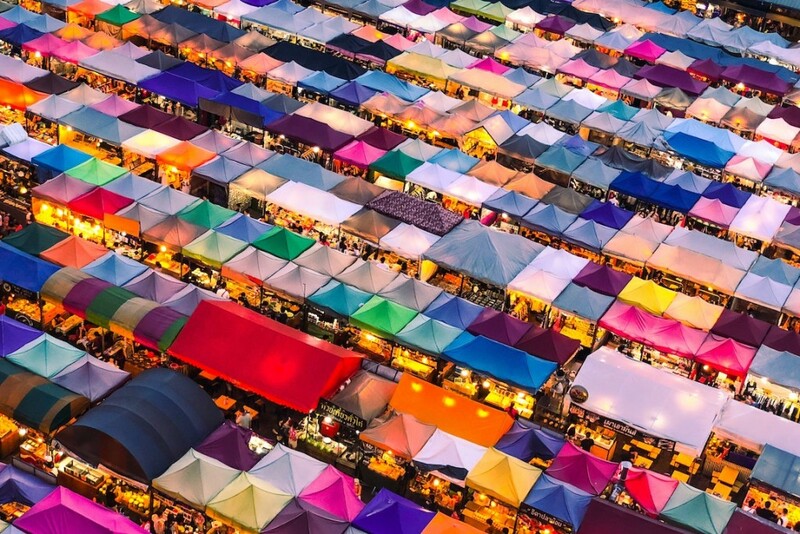 Chatuchak Market sells everything and then some, from food and fashion to art and antiques. Because this sheer size of this place would overwhelm any sane person, you can head to their website to look at maps, read their tips, and even book a guided tour if that’s more your speed. A paradise beach escape is within a relatively easy 2-3 hour day trip (depending on traffic) from Bangkok. From Bangkok’s Eastern Bus Terminal hop on one of the busses to Pattaya, which leave every 30 minutes and cost about 115 baht. 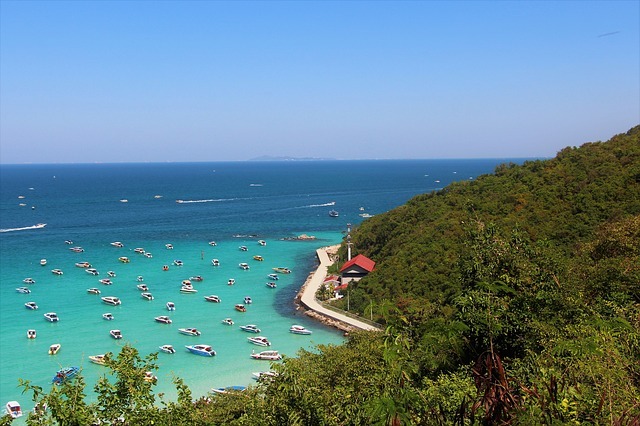 Once in Pattaya, you can take either a speedboat or passenger ferry to Koh Larn. Speedboats are of course faster, about 15 minutes instead of 45, but are quite a bit more expensive, and the ferries cost only 30 baht per person each way. You can find more info on getting from Pattaya to Koh Larn here. 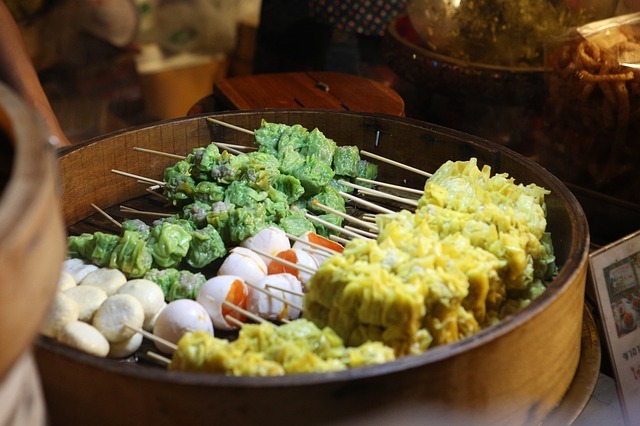 Possibly nowhere else on earth are street food stalls as widely renowned as they are in Bangkok. Masters of the culinary craft can be found all over the city, selling noodles, chicken, curries, and everything in between to hungry passers by. Sample, if you must, some authentic pad thai, as it’s probably the country’s most recognised dish, but remember this is the time to be adventurous, leave your comfort zone, and take your tastebuds on gastronomical exploration. Check out Chinatown, Rattanakosin, and Khao San neighbourhoods for an excellent variety of vendors. This ancient city can be reached from Bangkok by train in about two hours via Hualamphong Railway Station. This former capital is steeped in history, with numerous temples, statues, and museums to visit. Wat Thammikarat, a temple still in use, is home to another reclining Buddha as well as an interesting display of many roosters; Wat Phra Si Sanphet is beautiful in its ruined state and was once the holiest temple in the city; Wat Chaiwatthanaram is one of the old city’s most impressive temples. To make the most of your time in this spectacular place, consider renting a bicycle to get around more quickly and easily. 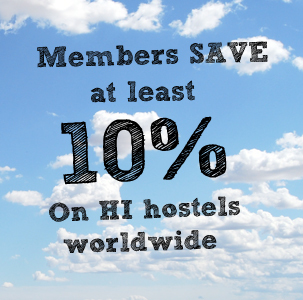 Stay at one of our fabulous Bangkok hostels, like HI Bansabai with its rooftop infinity pool, on-site gym, and beautifully decorated rooms, or iSanook hostel with its brightly coloured, modern decor in the heart of Bangkok.